Memories. Mine seem to be stuck on my iPhone. Attached to my Instagram. Every now and then… I scroll through my photos. It’s only then that I wish I had them with me. Physically. In my hands. Oh… I’ve printed them off at home. But it’s not the same. And my photo printer… blah. Opening up the Fellowes Saturn2 95 motivated me to find a way to get my memories off of my phone and onto paper! So… I did a little Google search and I discovered an app through Walgreens. It’s called Printicular on iPhone. (I’d love to know if it’s available on Droid… let me know.) The app allowed me to order prints from my camera roll and my Instagram! YAY! I started thinking of the perfect project to start with and immediately… I thought of a creating a mini album! 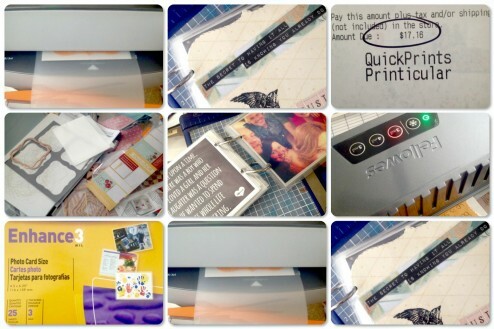 I love mini albums… they’re so easy to make and laminating it would allow the album to last a long time. I picked up my prints at my nearby Walgreens and excitedly hurried home. It was so thrilling to peek through all my pictures! It was as if I was seeing them for the first time! I used my Spellbinders Grand Calibur die cutting machine to cut some photo pages into a cute shape (Labels One) and I wrote sweet notes on some of the pages. Once I had the pages how I wanted them… I put them into Fellowes photo sized lamination pockets and fed them through the machine. It was so quiet! I had never used a home laminator before and I was totally surprised at how easy it really was! Fellowes’ Saturn2 95 laminator is the ultimate tool for back-to-school because it helps preserve important documents, like schedules, calendars, flash cards, charts, certificates, and more. Check out the Idea Center for inspiration and project ideas! Fellowes Saturn2 95 is available at Staples.com and Staples for a suggested retail price of $159.99. Fellowes offers a wide range of laminators to suit a variety of needs with products also available at WalMart and Amazon.com. o HeatGuard™ Technology: Double-walled insulation keeps heat inside so the laminator is comfortable to touch, making it safe for homes and classrooms with children. o Advanced Temperature Control: Hot and cold laminating capabilities ensure consistent, smooth results every time. o Release Lever: Permits easy removal or re-centering of stalled pouches to prevent jams.